← Can Small Sustainable Farming Succeed in America? Yes! Got back late last night from teaching a course at Kripalu Center for Yoga and Health in Massachusetts. 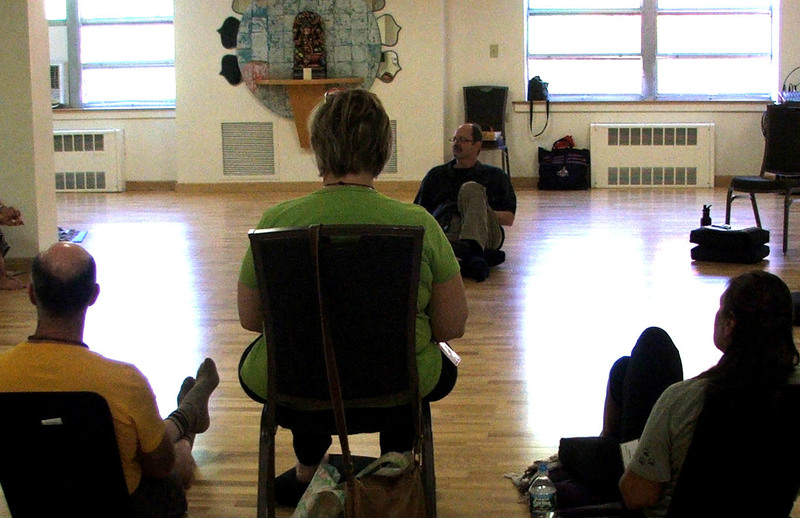 Author Jim PathFinder Ewing teaches a class at Kripalu Center for Yoga and Health in Stockbridge, Mass., Sept. 28, 2013. (Photo by Grace Walsh) Invited faculty, Ewing is considered a pioneer in eco spirituality. His latest book is Conscious Food: Sustainable Growing, Spiritual Eating (Findhorn Press, 2012). As regular readers know, I’ve authored six books about energy medicine and eco spirituality. My latest is Conscious Food: Sustainable Growing, Spiritual Eating (Findhorn Press, 2012). I can’t say enough good things about Kripalu. In many ways, it epitomizes what I write about. Even if you aren’t into yoga (which I’m not), as a retreat center, it’s a fabulous place to be. The food is spectacular — organic, sustainable and delicious. There are food lines for omnivores and vegetarians (though meat is sparing). The grounds are immaculate and filled with hidden places and magical spaces. It is designed for meditation, prayer and teaching. It was a great honor to be invited to be guest faculty. The students were wonderful and the experience was divine. This entry was posted in Archive/All Posts and tagged conscious food, health, kripalu center for yoga and health, MA, Organic, organic food, spiritual eating, spiritual retreat, spiritual retreat center, stockbridge, sustainable growing, yoga. Bookmark the permalink. Kripalu is my yoga of choice these days. I love it!